My husband is in a wheelchair & uses a walker and the staff was very helpful. We had heard so many rave reviews about this place that I think my expectations were too high from the start. It was a solid ok experience with no one thing glaringly bad but certainly not the standout experience I was hoping for. For one thing, many of the main dishes were priced in the $24-30 range, which to me pushes this closer to a three dollar sign venue as opposed to the 2 that it gets on yelp. Server was attentive but not overly, had to be prompted to give any kind of overview on menu (most of us were first time). Little things like cornbread starter that A) wasn’t out of this world and B) 2 of 3 orders of it were burnt around the edges. I had the butternut squash soup which had an odd addition of mini sausage balls which made it pretty salty - not at all what you’d expect and was not an improvement on the original. Also, they brought to me without a spoon and by the time I got my spoon the soup was pretty cool. Then for the salmon I received with two sauces and assumed the darker was a hoisin type sauce. 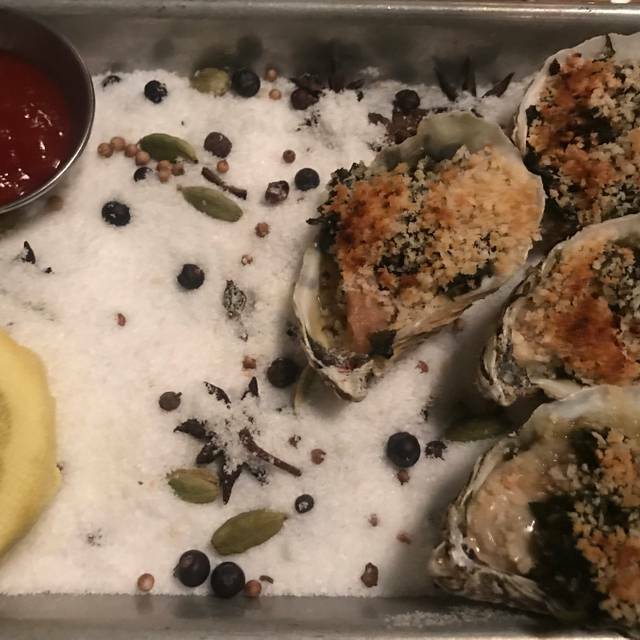 - it was actually bbq and though o eventually figured out how to balance it with the other lemon/caper sauce, it took a few bites to figure out - this is definitely something you’d want your waitstaff to mention or give a primer on before you dig in. Peanut butter chocolate bars were just ok. 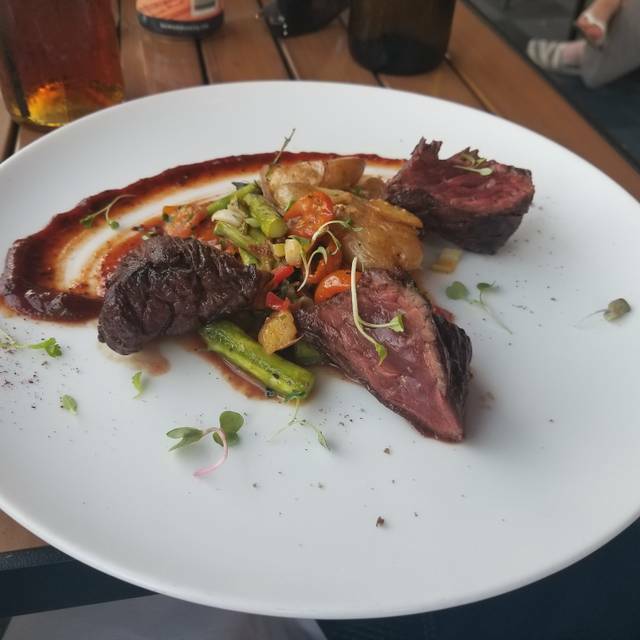 The one person who had been before remarked that it had been better previously and perhaps they are working out the kinks with a new menu, but with so many good options in the area, I’m not sure I’d rush back for another round anytime soon. The food was very good, but the service could use some improvements for the prices you're paying. For example, they brought out our salad, which we said we were going to share, and plopped it between us without plates. We had to chase someone down to get plates. Great surprise, the food was unique and delicious. The drinks were also unique and well presented but could be improved with higher quality spirits. Our waiter was helpful and prompt. There is only street parking but we had no problem finding a spot right in front of the restaurant. Overall we enjoyed our evening and we will return. Lovely spot, great food, excellent service -- why do I have to come up with 50 characters??? Delicious creative Southern cooking, with killer desserts. Thoroughly enjoyed our meal, from the drinks to the appetizers (deviled eggs and fried green tomatoes) to the entrees. The succotash was the surprising highlight of the meal --- flavorful array of vegetables that perfectly complemented the salmon and mac & cheese. This was without doubt one of the best meals foodwise I've ever had at a Del Ray restaurant. Great food and service with reasonable price point. Refined but still relaxed atmosphere. Wonderful dinner. Service was great. Good wine selection. Nice spot in Del Ray. 2nd time at Live Oak this year and each meal was about the same. Appetizer and salad were delicious, and one entre, the shrimp and grits was very good. The second entre this visit, the brisket was not good. Very chewy and fatty, and not the good brisket fatty. I was a great brunch but a little loud. I wanted to like this; I'd been once for dinner at the bar and enjoyed it--it's a fun neighborhood place. But the food at brunch was just ok. A friend and I had the chicken and waffles; I like dark meat and he likes white meat so we asked if we could each request that. The waitress handed me my plate and said "this is the dark meat" and him a plate with, she said white meat. But we each had a piece of white and dark meat. Had we known (the white meat wasn't really identifiable until you cut into it) we could have switched. Annoying. And it was ok fried chicken but nothing to write home about. Third time at Live Oak. Last time. Ordered a burger medium and it came out VERY well done. Draught list continues to be subpar. Waitress was ok. She should’ve comped the meal after I showed her the burger. Friend ordered pork chop which she liked and finished. 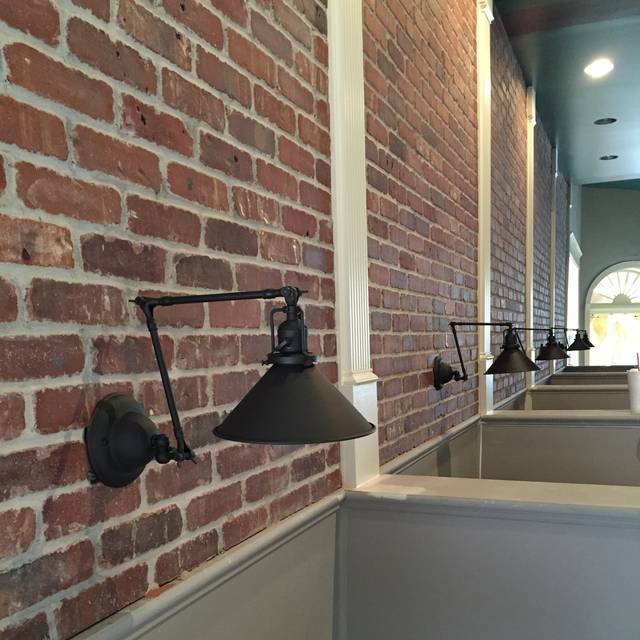 Craving for southern comfort food but Live Oak did not satisfy the craving. Food was mediocre and to even sub par. The ribs was barely cooked and the meat could not even be cut off with a steak knife! Dessert was disappointing; looked better in pictures. Would not recommend. The service was very attentive and friendly. The food was very good with a surprising selection for vegetarians at a southern restaurant. The cornbread, tho: soooooo good. Absolutely terrific! 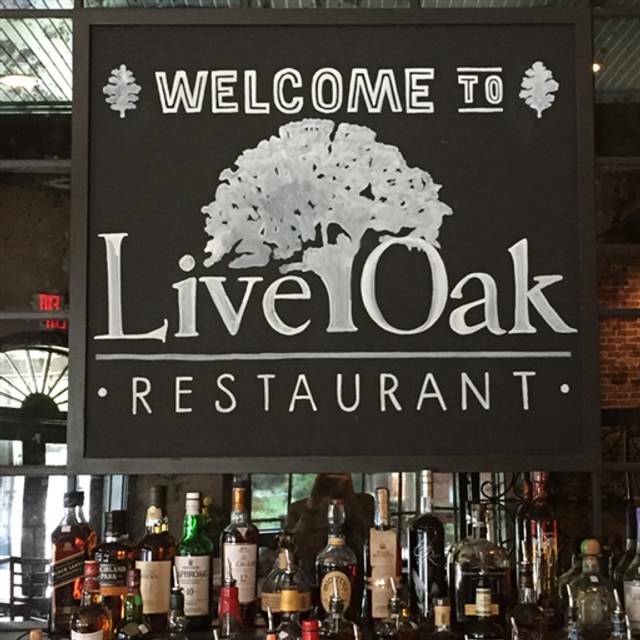 A friend from work recommended Live Oak. I will definitely second that. Had Brunch this past Sunday. Menu was creative, food was delicious and service was impeccable. Not to be missed! Small menu but likely appeals to most palates. I had the special flank steak over squash and date had the grits. We followed up with the peaches from the app menu. Food was devine and very flavorful. Highly recommend for any occasion. Fabulous meal and wonderful atmosphere with great neighborhood location near Del Ray and Rosemont. It's a bit noisy when busier, but was quiet on the holiday weekend, which left us with cozy, private feeling in our two-person booth. Love these small booths! They had a special gin drink which was yummy. Can't wait to see the Fall menu! I really enjoyed the meal. 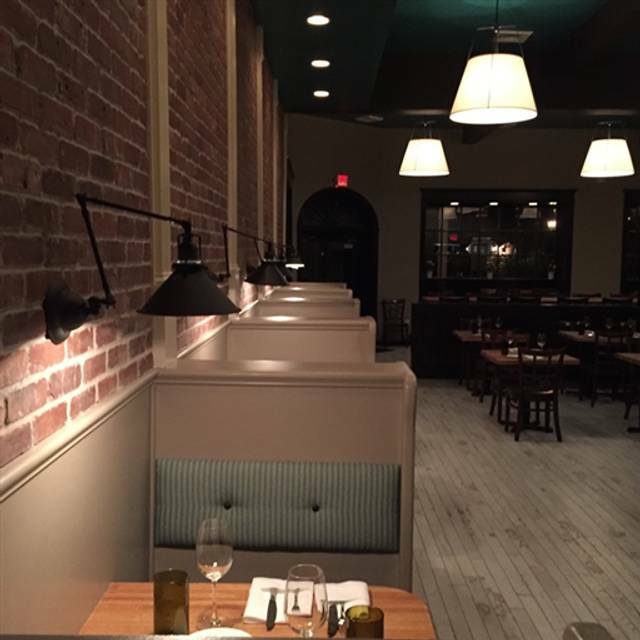 The food was excellent and the service was very nice the entire staff was very friendly. The atmosphere was casual which is exactly what I appreciate. I look forward to the next meal there. This was my second visit to the restaurant, but first with my husband. 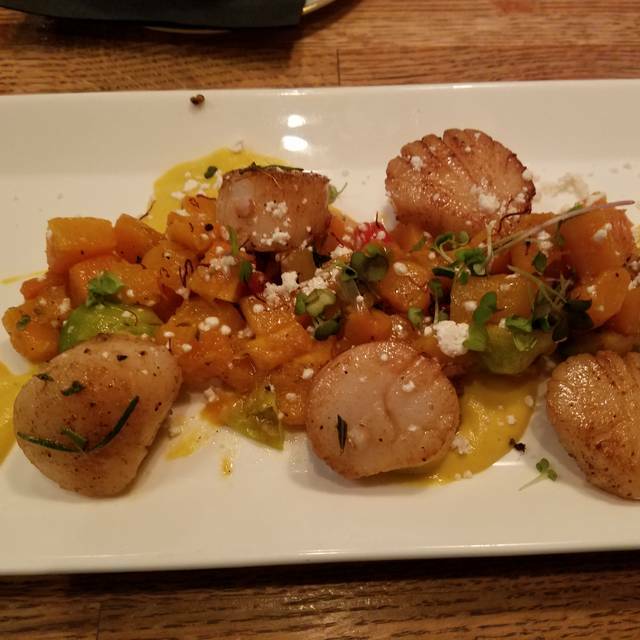 It was Restaurant Week, which made it fun to try different menu items. Mike, our server was attentive and the bartender prepared his award wining Whiskey Sour for us, which we both really enjoyed. 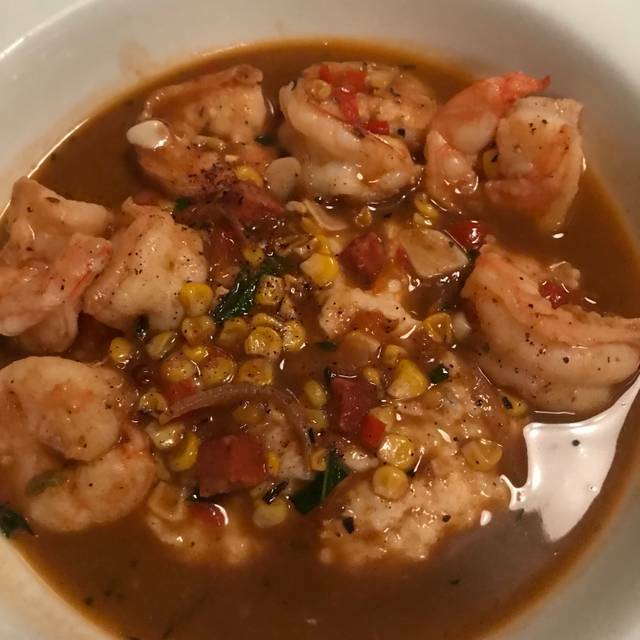 The Shrimp and Grits was both of our favorite dish. I enjoyed the Gazpacho and my husband loved the Deviled Eggs. We plan to go again soon. The 4 of us went to Live Oak for Restaurant Week and I'm glad we did. Each of us ordered something different from the menu and shared. 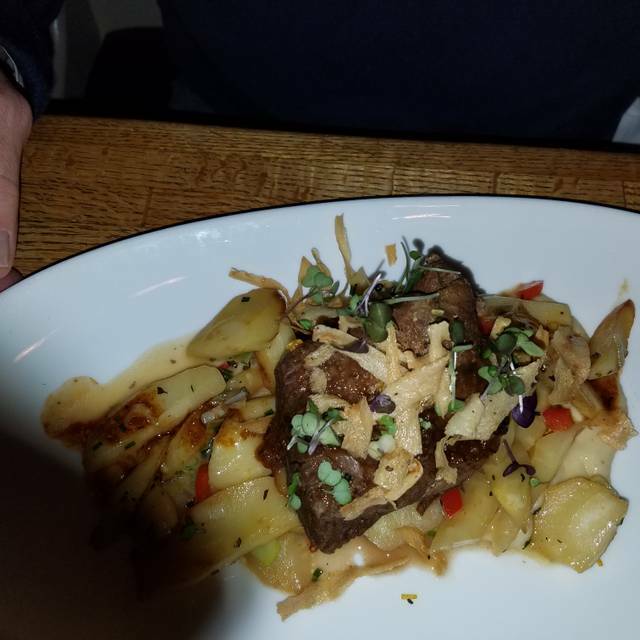 All was outstanding--especially the Short Ribs. We will be back and highly recommend! We had the restaurant week menu, $35 for a well-rounded three course dinner, a good value. A very nice neighborhood establishment. 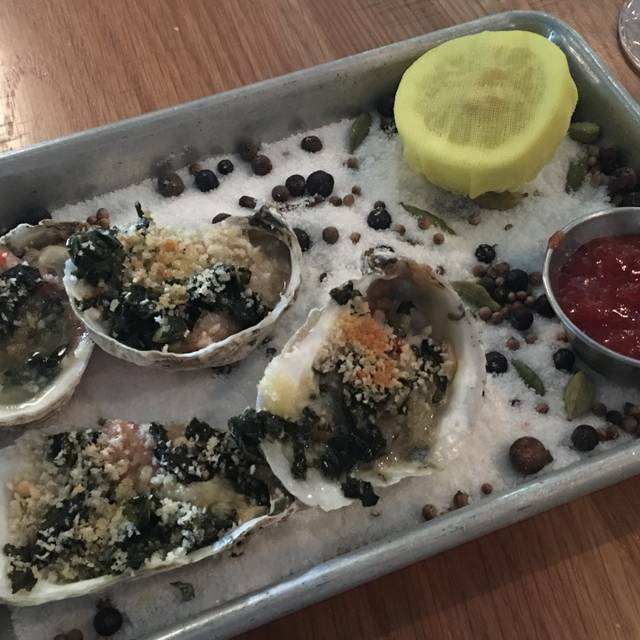 I like to try new restaurants during Restaurant Week and I had never been here. The place was on the quiet side; I'm guessing most people were out of town for vacation before school starts. The service was attentive, and everyone enjoyed their starters, mains, and desserts. The blueberry buckle is definitely worth ordering, especially for the burnt honey ice cream. Next time I go, I'll be ordering the peanut butter squares for dessert! Went for Restaurant Week with friends. Will definitely be going back again! First time visiting for a date night during restaurant week. The service and atmosphere were great. Interesting cocktail list. I felt the restaurant week menu represented the restaurant very well and we enjoyed every dish. The portion seemed a little small but probably due to the restaurant week. The only downside was that there were a couple of flies flying around in the restaurant buzzing around us. Otherwise, very clean and well decorated, fun restaurant. Will be back for sure! Our server, Mike, was both accommodating and attentive. That sets the tone of the dining. The food is always good at Live Oak. What a great little find in Del Ray! We met friends for dinner during the week. It was not crowded and the atmosphere was great. Good food selections (even for GF diners). We will definitely be back! In spite of the loud talking table behind us and the annoying waitress, this place was great. Food was great, server not very attentive,we ordered appetizers that one came out with meal (server forgot) and other was a rush because it wasn't even put in. Just little things but food and company were great. The food was amazing. We did get a cornbread skillet that didn't have the cornbread cooked in the middle, but they corrected that quickly and provided another appetizer in the meantime. The scallops were delicious and the softshell crab was very well done. We also had the chess pie which was so decadent, but you can't help but finish it. Amazing food will definitely come back! Great flavors were combined to make each dish delicious! It’s a neighborhood restaurant, only open 5 to 9 pm, with brunch on the weekend. Very quiet, with great service. Ambience- did not like the elevated booths for two. Bar looked inviting. Loved the ceramic white oak like floor and the restrooms were cute. Service was extremely slow. Barely ever saw our waitress. Had a great dinner with the family. Service was spot on and the food was delicious. Can’t wait to return! This was my first visit, I read amazing reviews and decided it was perfect place for date night. I'll start with the great, my drink was very delicious, ordered Pimm's Cup. We shared the Meat & Cheese Board, we both enjoyed it very much. I had the Chicken Breast, which was the most tender, juicy breast i have ever had. It was delicious with the side of veggies. However, my boyfriend, did not like his and sent him home with stomach ache. He ordered the Chesapeake Soft shell Crabs. He is a seafood lover, we both felt disappointed as he did not enjoy his meal. Overall I would give this place a second visit, and try new dishes. Interesting menu itemsperiod a great combination of flavors however the execution was off a little bit too much sauce in too much salt. Fabulous desserts. Great Brunch. Chicken and waffles! Two of us ordered the soft shell crabs on the vegetable base and thought the meals were extremely delicious and perfectly cooked, unlike a previous reviewer who complained about this dish. Would order it again. The Black Sea bass was delicious but portion size of fish too small for that price. The side dish of asparagus, peas, leeks was very very tasty; good value. Cucumber & strawberry soup was flavorful. The mixed drinks seemed weak and the wine pour small. I’ll have beer next time. Service was inconsistent. Food quality and flavor 5 stars. A little pricey.